SAP AG.co in Will Give information of SAP related meterials Like SAP Platform and Operation,,SAP Security , SAP Enterprise Portal (EP), ,SAP Knowledge Management (KW), SAP Business Intelligence (BI), Exchange Infrastructure (XI),Application Server, Mobile (MI), Master Data Management MDM, Composit Appications Frame work,Web Dynpros,OOPABAP,Blog,Intergration Bulder, Integration Repository (IB),Integration Directory (ID).System Landscape Directory (SLD), And Adopter Configuration like File to File,File to JDBC, File to IDoc, File Content Convertion, RFC, HTTP,SOAP,XI Interview Questions,Xi Sertification Questions, and many more about SAP Netweaver Platform XI Training And Tutorial and XI interview Questions .. The People Integration , Information Integration, and Process Integration Capabilities of SAP NetWeaver all sit on an application platform called the SAP Web Application Server (SAP WebAS).This is a tool for building and running applications. 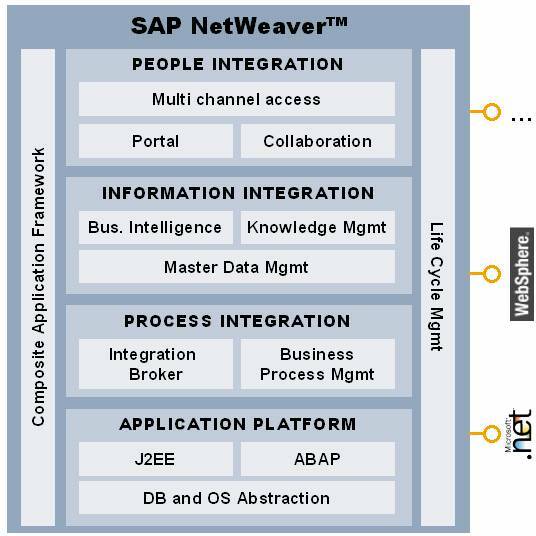 Another Important part of the SAP Netweaver Equation is the SAP Composite Application Framework (CAF) The SAP CAF is a tool for creating new application by combining pieces of existing applications to do entirely new things.FInaly lifecycle Management is a set of utilities that help make the process of installing software ,running it ,upgrading it ,and fixng bugs as smooth as possible.These two boxes were placed on the right and left sides of the box in figure to show that they play an important supporting role in SAP Netweaver.